Annupuri is one of the four resorts making up Niseko United and is about two minutes further down the road from Tanuki Lodge than Moiwa Ski Resort. On the west face of Mt. 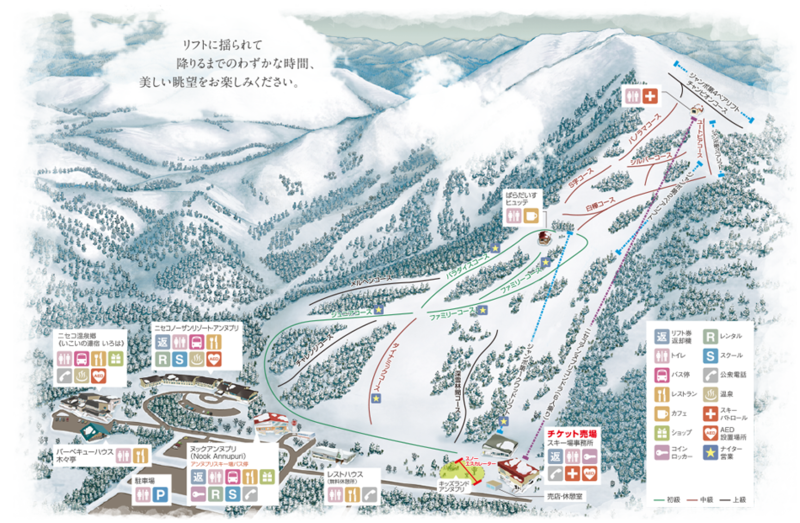 Annupuri, the resort is usually less crowded than the Hirafu area of the mountain. With fourteen ski runs, a gondola and six chair lifts Annupuri will also give you access to the other three resorts which are part of Niseko United and is part of the Niseko United ticketing system. It also has three gates from which to get access to backcountry and the famous Annupuri Bowl. Annupuri has several restaurants either at the base of the mountain or within 5 minutes walk.There are vending machines around the gondola station if you want a quick hot or cold drink before you head up for your next run. Shuttle Buses run from Annupuri Ski Resort to the other three resorts in Niseko United, Kutchan, Konbu Onsen and Niseko Town at regular intervals. The shuttle bus is free if you have a Niseko United All Mountain Pass.